Image caption Smart cookie Katie Francis: "It takes lots of time, commitment and asking everybody I see"
A US Girl Scout has broken the organisation's national record, selling 18,107 boxes of cookies in seven weeks. 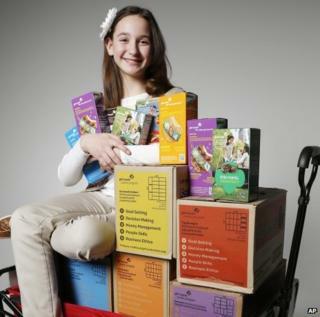 Katie Francis, 12, of Oklahoma City, said the secret of her success is asking everyone she meets to buy a box. Not one to rest on her laurels, Katie has now set a new target of 20,000 boxes by 30 March - the seven-week cookie season has been extended by a week because of recent wintry weather. The previous record was about 18,000 boxes, set in the 1980s. Katie, who has been invited on to network television shows to discuss her feat, was also the Girl Scouts' top seller last year when she shifted 12,428 boxes of cookies. The sixth-grader told local TV station KOCO: "There are three ingredients to the cookie sale. It takes lots of time, commitment and asking everybody I see." Her troop receives a share of the proceeds from the fundraiser and said it intended to donate to breast cancer research. It is not the first time a business-savvy Girl Scout has made headlines recently. Last month, a 13-year-old in San Francisco made the shrewd decision to set up her cookie stall outside a medical marijuana dispensary. Supervised by her mother, she sold 117 boxes in just two hours.